Parents should focus on these 8 goals for preschool training to develop their children's character and other life skills. School Readiness Skills and some academic preparation should be developed in the preschool years, but not at the expense character training. These 8 Goals for Preschool Training highlight some points on which parents should focus during this critical time in their children's lives. Teach your children to love one another and obey their parents. If you allow them to be selfish (which we all are by nature) and disobedient, then having them at home during their preschool years will not be a pleasure for anyone. This is not a quick "first step" to successful preschool years. Preschool training is an ongoing process. There are plenty of books and materials on this subject if you need help in this area as building good sibling and parent-child relationships should be one of the major goals for preschool training in any family. It is a Biblical mandate that we should love one another and that children should honour and obey their parents. Your child should learn to enjoy his relationship with his parents and his siblings. All the social skills he needs, he can learn in the safety and security of family relationships and interaction with friends, relatives and acquaintances of the family. He can learn correct forms of address for different people, proper manners and good behaviour by living alongside you. As adults, we don't necessarily socialize every day, yet we still maintain good friendships and children can do the same by socializing with family friends as often as we, the parents do. Let your preschooler help you with your work - tidying the house, peeling vegetables, pottering in the garden or the garage. Let her accompany you to the post office, the bank, the library, the supermarket etc. and train her to behave properly in public. Many believe that children won't learn to socialize and interact well with other children, unless they have opportunities to play with their age-mates during their early childhood development. However, there is evidence to show that the type of socialization that occurs is often negative and leaves children feeling threatened and insecure and often they show angry behaviour. I have observed this in children of my friends who go to playgroups. To me, the homeschooled preschool-aged children that I know are much more self-confident and thus less aggressive with other children than the preschool-going ones and their characters are better trained. Let your child discover during his preschool training that he can make a meaningful contribution to family life and teach him to be self-disciplined. They say that self-discipline is the best discipline. Little ones can learn to tidy up after themselves by picking up their toys. A friend of mine has a rule that her girls can only take out one set of educational toys at a time and only when they have put away the other toys. Train your children to have a good work ethic by giving them regular household chores that contribute to the smooth-running of your home. Even a toddler can learn to dump a diaper in a bin or place dirty clothes in the laundry basket each day. At preschool age, a mother should work alongside her child, helping, directing, training, encouraging and praising junior for her efforts...and don't always redo the task for her, if it is not perfectly done, rather praise your child for her achievement and her helpfulness. Also, if you have a good attitude towards your work it will rub off on your child. There is also a wise saying that says we should allow our children help us while they still want to. This means that our work may take longer or may not done to perfection by the child, but the benefit of the time spent will be reaped in the future as the child becomes more proficient and able to do tasks alone to help you. So "Lifeskills" should be one of your goals for preschool training too! Allowing them to help also helps them develop self-confidence, self-worth and a sense of being capable. Many adults lack those traits because their mother did everything for them, or redid what they had done if it was not done to adult standards. 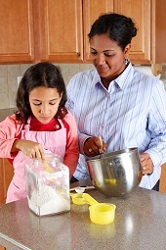 Give your child specific instructions, especially for big jobs like tidying a room. Rather say to your child, "Pick up the clothes," and then "Pick up the toys," instead. When there is a big mess to clear, I often say to my children, "Put away 5 (or 10 or 20) toys first," and when that is done, then I give them another number of items to pick up. Breaking the task into smaller 'bits' makes it less daunting. This should be part of #1. We need to model humility and forgiveness - when we get angry or frustrated or provoked to be unloving in any way, we need to be humble enough to admit our fault to our children and ask forgiveness of the person concerned. They, in turn need to be trained to release their hurt or anger and express forgiveness to the person who is asking it. No grudges or sulking should be tolerated. Learning is child's play, so give your children plenty of free time to play and entertain themselves. Limit their TV viewing, playstation, or any other electronic entertainment and rather encourage them to play outside or amuse themselves with other more traditional indoor activities - toys, games, drawing, coloring, painting, dressing up etc. Many of us forget that educational activities are only one part of training up a child and that they are sometimes best left until a child is older than 8. In fact, a child's creativity could be stifled if he is constantly given directions and instructions regarding the 'proper' way to do something. A child who is always given instructions and kept occupied may display less initiative and innovation and instead of enjoying freedom to explore and discover, he may rather look to those in authority over him for what to do and how to do it. He may begin to fear doing something 'wrong' instead of investigating other possible options and exploring creatively. Children need the freedom to explore nature in their surrounds, to experiment in their own way with art supplies and to be creative and imaginative in their play during their early childhood development and beyond! It may seem obvious to want this to be one of your goals for preschool training, however, learning should not be forced but inspired! Read, read and read to your children - not to pump their heads with facts and information, but rather to stir up in them a delight for books and stories. Studies show that the biggest determining factor for a child's success in reading in school is if they have seen a parent reading in the home on a regular basis. Reading aloud encourages children to be attentive and develops their concentration skills as well as auditory perception. Reading fosters good language development, building children's vocabulary and grammar through exposure. Reading also exposes children to the ideas of authors, giving them food for thought and stimulus for their own imagination. They can learn about other places, people and eras through the world of books. Reading helps improve comprehension and cognitive abilities. It helps children to anticipate possible outcomes for various scenarios and improves problem solving abilities. It also helps develops analytical skills and logic. And not least, reading helps to build family relationships, giving you a wealth of common knowledge to share and refer back to as well as creating time for cuddling up together and being physically close to your children. When you are reading, you are not reading TO your child, you are sharing a book WITH your child, which is a great way to build your relationship! Parents need to relax and trust that their children will learn what they need to learn in their own time. I know that there is tremendous pressure from all sorts of well-meaning people encouraging moms to put their children in preschool or teach them STUFF, for all sorts of apparently good reasons, but the more I research preschool and homeschooling, the more I find that many of them are misled and that there are flaws in their thinking. Trying to give children a "head start" is often counter-productive in the long run. Academics have a place in children's development, but should not crowd out the other things that children need to experience. All parents need to do is to create a stimulating environment for their children and then relax and let children grow and learn at their own pace. As a Christian, I believe that learning to be a Christ-like person is the most valuable lesson to teach my children! "Kids learn from parents and teachers very little of what is intentionally, consciously taught. What kids do in fact learn is modeled upon what we are, not what we preach; not what we say, but how we say it; not what we ask of children, but what we ourselves do." This is something that is an ongoing process, learned day by day and moment by moment as they watch their parents exercising patience, coping with interruptions, giving comfort and encouragement, and trying to meet each child's needs. I believe that parenting is character training for adults! As we learn to die to self and serve others with humility and a good attitude, so they will learn what is right. They are watching and observing every little detail of our facial expressions, intonation, body language - which is why it often so amusing when we 'see ourselves' in them - but all the more reason for us to be aware of what we are modeling and to be humble enough to admit it when we fall short of our ideals! Homeschooling? How Do I Cope? 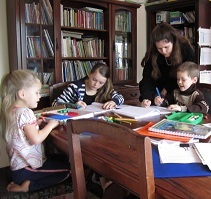 By definition, homeschooling means that mother is a stay-at-home-mom. 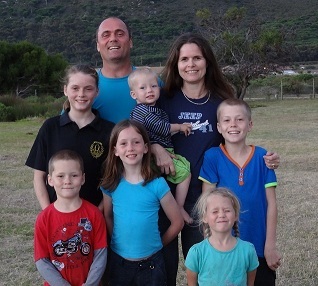 Usually, this also means that the homeschooling family therefore has to survive on one income. By means of this website, I am able to be creative, enjoy mental stimulation as well as earn a good income, while fulfilling my role as wife and mother to my large family. Click here to read my Success Story - it could be yours too!